Our protagonist Isabeau (nicknamed Dove Isabeau because she always wears grey and white) lives with her father in a castle on the shore. All the boys love Isabeau because on the outside she is sweet and mild, and none love her more than the king’s son Kemp Owain, who, rather than for her looks, loves Isabeau for the “spirit and fire that lay beneath [her] skin”. After the passing of Isabeau’s mother, her father remarries another woman and, as many fairy tales seem to go, this woman both hates Isabeau for her youth and beauty and is an evil witch. The nameless witch wants nothing more than to kill Isabeau and so lures her poor stepdaughter into her room late one night. Granted this chance to maybe earn some warmth from her stepmother, Isabeau readily follows. However, in an instant, the witch casts a spell on her, turning her into a fearsome red wyrm. Believing her held captive by the beast rather than transformed into it, young men from across the kingdom come in the hopes of rescuing Isabeau from this foul beast, yet they either end up turning tail in fear or falling to the Wyrm Isabeau’s claws. It doesn’t take long before Kemp Owain, too, comes to try his hand. This time, however, the would-be hero is met by Isabeau’s late mother’s cat, who reveals to him the counterspell to Isabeau’s transformation: attacking the wyrm will surely fail, but giving the wyrm three kisses will release Isabeau. Releasing Isabeau also means forfeiting his own life, as on the final kiss he will be turned to stone. Kemp Owain is willing to make this sacrifice. Now freed and witnessing Kemp Owain turned to unmoving stone in front of her, Isabeau returns to the castle and murders her stepmother out of grief and rage. Though the witch is now dead, Isabeau has no idea how to undo this part of the witch’s spell. Luckily, the cat again is the MVP and manages to reverse the spell through some licking of the stone. And so Kemp Owain and Isabeau lived happily ever after. While every fairy tale needs a good villain, even back in my youth I don’t think I found the witch very compelling. She doesn’t even get a name! More than that, though, she simply doesn’t have a reason to be doing any of this outside of supposedly wanting to rule the kingdom and being jealous of Isabeau. One glaring flaw of her plan is that she wanted to use Wyrm Isabeau to murder all the young men in the kingdom so she could take over. Forgetting for a moment that there’s no doubt in my mind the women could probably provide more than an ample fight, and that there is probably a “good” witch in their ranks somewhere, there are still the older men, and it’s the older men who have the armies and titles. Killing the young men just means the old men have to make more offspring. Yet even if there are the women around to help give birth to more young men, they’re not spoken of. While the nameless princes and kings are brought up, the only women of this story are Isabeau, the witch, and Isabeau’s dead mother. In a world that is presumably as robust as our own, it’s disappointing that this story sets up, once again, this tired dichotomy of the one “good” woman versus the one “bad” woman. The important part of the witch, though, is that she’s simply another character that upholds the “being old is bad and makes you evil” trope that still permeates our media today. Her jealousy over youth and beauty ends doesn’t even end up being a character trait: if one were so obsessed with such traits and they just so happened to be a witch, the assumption would be that they would use a spell to make themselves young and beautiful in the process of torturing their young, beautiful stepdaughter. Instead, she’s just a horrible older woman who shakes her magic wand at all these young beauties; her obsession isn’t about having youth or beauty, but rather about villainizing and loathing the people who have it. Without any other older characters to play against, the story ends up making the implicit argument that growing old is bad, and that those who age will end up consumed by anger over the things that they no longer feel they have. Still, the ending of this story is probably one of my favorite things ever. For one, the “hero” isn’t rewarded for typical shows of masculinity. He doesn’t have to slay the beast to get the girl. Isabeau isn’t his “reward”. Instead, by being gentle and self-sacrificing—by listening—he both frees her and gives Isabeau something to fight for. In turn he earns her heart. Furthermore, Isabeau gets the chance to fight back against the woman who abused her, giving her an agency rarely given to women in these sort of Sleeping Beauty-esque fairy tales. It’s Isabeau who defeats the witch, who murders her in cold blood because she cannot forgive her for what she has done. Isabeau is not punished for this “break from character” either. The narrative paints this as a good and just thing, a true reveal of the strength of Isabeau’s character that many of the others pursuing her failed to see or ignored in favor of the docility they assumed she personified. Yolen enforces this by what she writes on the final page. Kemp Owain proves himself worthy of her by accepting and loving all of Isabeau’s facets, and by taking pride in the power that she wields. And if that isn’t a good message from a fairy tale, I don’t know what is. Some parts of me are disappointed that Dove Isabeau hasn’t become a staple of the fairy tale repertoire, but at the same time I can’t help but feel relieved. Even though it isn’t a particularly nuanced story, or one that is difficult to understand, it still feels like one of those stories that would get ruined at the hands of Hollywood execs trying to make it appeal to a younger audience and a potentially more male demographic (who wouldn’t abide by the “hero” being out of commission for the entire climax). 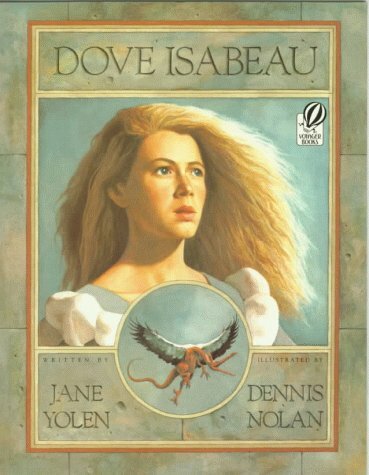 Love and evil witches might be trope-y to hell and back, yet Dove Isabeau manages to remain a fresh story almost thirty years later. If possible, I really do recommend you check it out, both for Yolen’s writing and the art that goes alongside it. This entry was posted in Books, Fantasy, feminism, Throwback Thursdays and tagged Books, Dove Isabeau, fairy tales, fantasy, feminism, Jane Yolen, throwback thursdays by Tsunderin. Bookmark the permalink.